I absolutely couldn't wait to get started reading Dreamfall by Amy Plum because, you guys, it's AMY PLUM! It's been a while since I've read a book by Amy, so I was really excited to read something new by her. 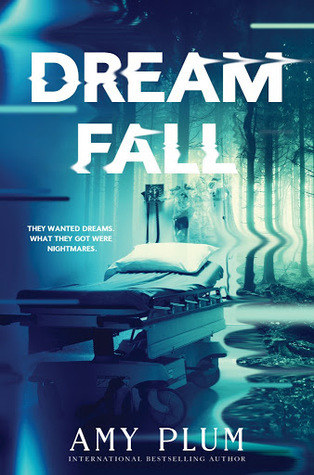 Dreamfall was not at all what I expected, but I did find it to be an interesting read! Dreamfall is full of a lot of interesting characters, and they meet because they all have one thing in common; sleep disorders. When an experimental procedure they are all participating in goes terribly wrong, they are thrust into a shared dreamworld, with absolutely no idea how they got there. Interesting, right? The story is told from a few of the characters different perspectives, and I really liked that in this story, because there were SO many different viewpoints to see the story through. Coming in at just 288 pages, this book was a really quick read for me. I wasn't sure that it would be, because I did not know until after I started the book that it's a horror story. I, admittedly, am not a big fan of horror, mostly because I'm a big ole chicken, but I'm pretty proud of myself for actually finishing the book. I actually almost put it aside at one point, because... there are a lot of nightmares. And they are probably going to give ME nightmares. (I see lots of cute kitty videos in my future.) Also, the end of the book seriously left me asking, WHAT?! I'm really curious to see what's going to happen next. Overall; Although I'm a big chicken when it comes to horror stories, I thought Dreamfall was a really interesting read! I'm curious to see where the story will go in the next book, Neverwake, which is due to release in 2018. And again, it was super nice to read something by Amy Plum again! Oh my goodness! Totally adding this to my TBR! Sleep disorders!? That sounds so interesting, yet, I'm a big chicken too- so i'll make sure not read it at night HAHA! Nice! I'm about to start this one next! Excited and nervous since some of my past experiences with Amy's books were only so-so. But maybe this will be the one because it sounds super creepy! Great review!